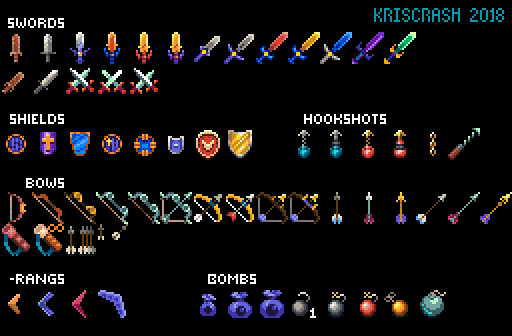 A large set of detailed and colourful weapons/items. Includes swords, shields, hookshots, bows/arrows, boomerangs, bombs, the ZC rings, colourful rupees, fashionable boots and flippers, maps and candles to guide your travels, and just things to buff your magic, health and keep you warm and safe. 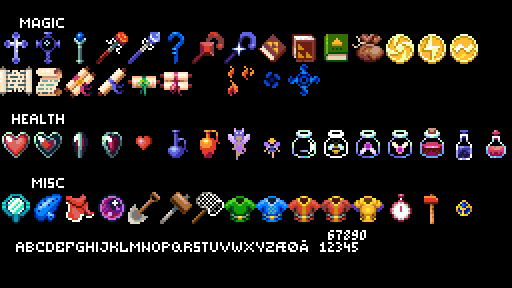 Put my name somewhere if you use them, and do look me up on discord if you want me to draw more items. These look pretty dang nice. Thanks. Really nice items and weapons.